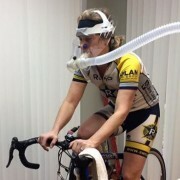 Almost exactly a year ago, I did a metabolic efficiency (ME) test at Silver Sage Sports and Fitness Lab. 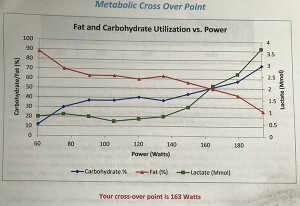 In my blog last year, I discussed fuel sources and what the ME test evaluates, namely, it tells us how well our body utilizes fat versus carbohydrate as an energy source. The results of my 2017 test were a bit sobering — I did not burn fat when riding my bike. Like, not at all. 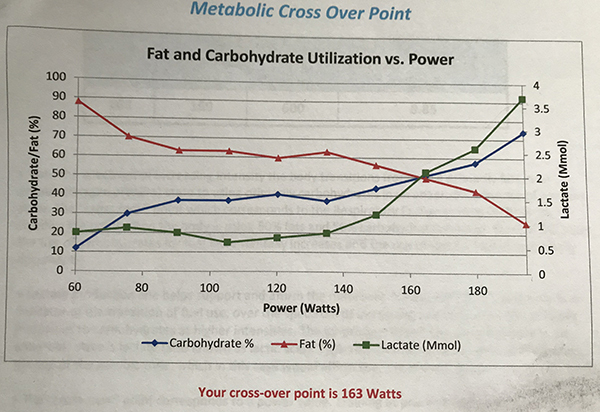 The graph is supposed to show, among other things, when you are burning 50% fat and 50% carbohydrate, or your cross-over point. 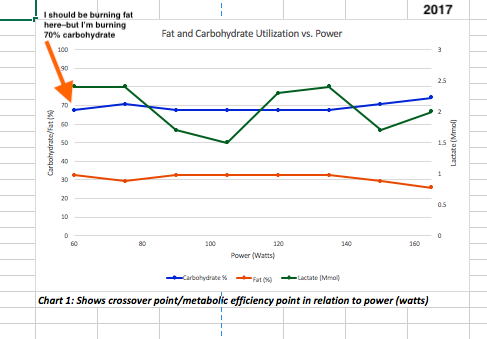 After your cross-over point, carbohydrate as a fuel source increases, while fat utilization decreases. One minute into my test — my respiratory exchange rate (RER) was .82 (.85 is considered the 50/50 point). The test ends when RER hits .9 and mine ended when I reached just 166 watts. 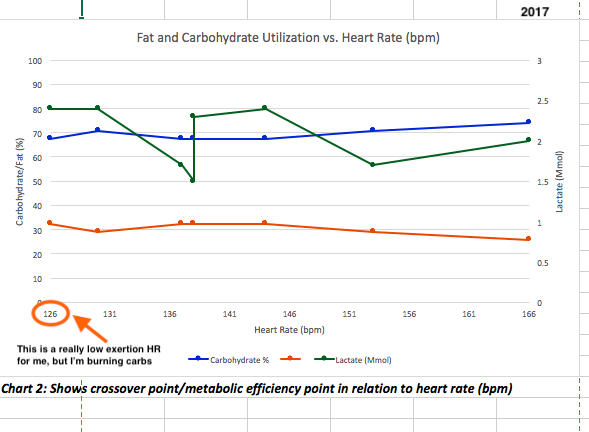 If you take a look at my graph from February 2017, you’ll notice there is no cross over, just a blue carbohydrate line hanging out high above a fat burning line. From the start of the test, at a mere 60 watts (you know, barely pedaling), I was not burning fat. As far as the test was concerned, I hardly burned any fat while riding my bike. Also of note, is my lactate line (the green one.) Lactate is a by-product of your metabolism that is produced during exercise. Mine is kind of janky in the graph, straightish with drops – there is no trending curve. The blood lactate profile is considered the most important predictor of endurance performance potential in steady-state events. So, this would seem to indicate I didn’t have much of an endurance base. Together, this information was not painting an optimal picture for someone who competed in events ranging from :45 minutes (cross) to over 4 hours (mountain biking and endurance gravel). At the time of my 2017 test, I was just starting a year of training with Julie Young. 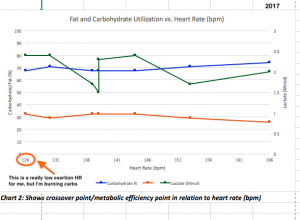 She, and my research, indicated that I could actually affect my metabolic efficiency by making changes to my diet and training – namely, starve my body of carbs and ask it to do low intensity work. So, for the past year, that is what I did. Julie’s program included much more low and medium endurance zone riding than I had done in the past (I had always thought, going hard got you fitter, faster. I was wrong). In addition to Julie’s structured training, I changed my diet pretty significantly. I reduced my intake of carbohydrates to about 25-35% of total calories (more meat, lots of nuts, copious amounts of veggies, cut out bread and pasta) and I cut out sugar almost entirely (just eating fruit sugar). In the course of a year, I completely turned my fuel utilization around. While the blue line (carbohydrates) was on top last year, the red (fat) line is on top this year! 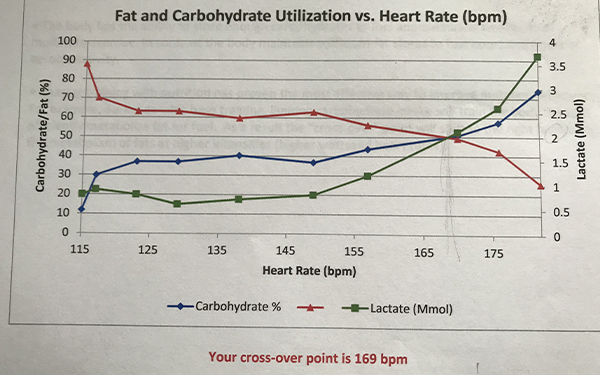 Using the same testing protocol as last year, slowly increasing power with a lactate blood test every 3 minutes, I started the test using nearly 90% fat as fuel (vs 32% last year) with a respiratory exchange rate (RER) of .74 a minute into test. 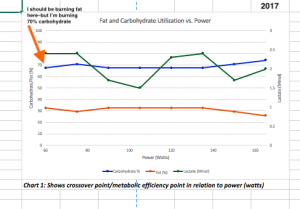 My cross-over (the 50/50 carb/fat utilization) was 21 minutes in at 165 watts. At the end of the test, when RER hit .9, I was at 195 watts (vs 166 last year). And take a look at my lactate, the green line. It’s got a curve! This indicates some actual aerobic fitness. Which, in retrospect, indicates I didn’t have much last February. Hypothetically, I can now go longer with less fuel because my body can use its own stores better. Very exciting! Yet, what does it really mean? Looking back on the goals I hoped to work toward using information from this test: I hoped to get a handle on my race cramping and on fading at the end of a race. Did my cramping go away? No. Did my racing stay more consistent? While I had a pretty disappointing year, results wise, there is evidence my shorter cross races were more consistent lap-to-lap. All of my long races were derailed by cramping at some point, so I cannot evaluate positive changes to my staying power. I do notice that I don’t get the spikes in hunger like I used to — I don’t get hangry as often. I need much less food when I train now. I can get up and do a two-hour ride with no food. During a 3-4 hour ride, I drink one endurance bottle, a bar and a few nuts. I have more longer endurance events on this year’s schedule, so it is reassuring to know that my metabolic efficiency is now on board with that plan. 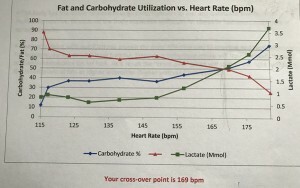 I have force fed myself during races for fear of bonking (which is a pain to do at race pace and also causes stomach upset), and now I know I don’t need that much in-event fueling. I also have a clearer understanding of how to fuel my training – low intensity efforts get fat, high intensity efforts get carbs. I certainly understand the value of all the low intensity volume Julie had me do and, now that I’m training myself, I have to be careful not to fall into old habits of riding shorter and harder. While it conserves time, it doesn’t make me perform better. There is definitely value to knowing the science behind your performance. Even if you’re a middle-aged, working, mom-of-a-high-schooler, master’s rider – maybe especially if you are one. We don’t have time to waste doing it wrong. Check out the menu of physiologic testing available at Silver Sage. It’s pretty impressive the quality of the testing tools that are available to us. 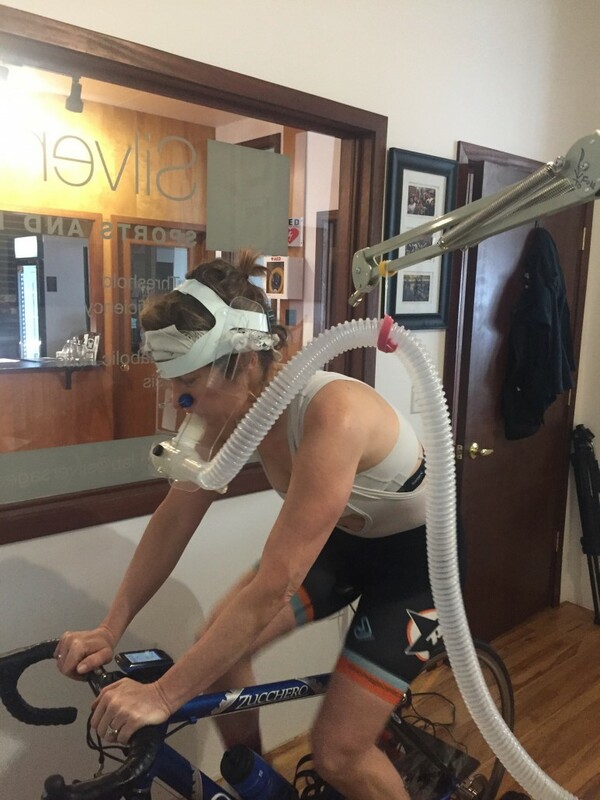 Next up, I need to dial in my lactate threshold to make sure my training zones are accurate.